Wild About Gardens offers Landscape Design Services and Horticultural Consultation. We provide a consultation only service for clients requiring professional garden advice on a small scale eg. ways to revitalise sections of an existing garden or for very basic planting plans. Advice, notes and a sketch can be provided during the time on site. The usual process is to make a time to meet on site to discuss your needs where we take a brief about what you would like as well as check measurements and details and ensure we have all the information needed to prepare a comprehensive design. If you can provide a scaled site plan it will save time measuring up or for complex sites a survey may need to be commissioned. For new homes/buildings please provide all available documentation including floor plans and elevations. Present as much information at this stage as you can about styles, features, preferred plants and materials etc to ensure you achieve the outcome you want. Remote projects can be assessed and quoted from plans, photographs etc. if a site visit is not possible. After our consultation, a design proposal is prepared which will indicate costs and what you will receive for your fee. A concept plan may need to be prepared to ensure you are happy with the layout before we proceed to a final design. 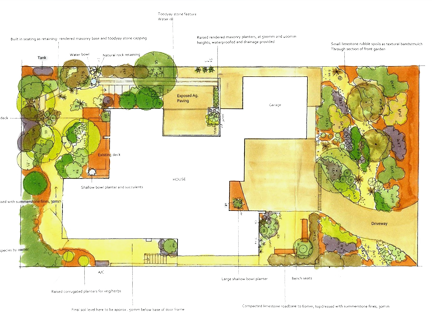 When the design proposal is accepted and any concept plans have been approved, the final plan is prepared in further detail, including a comprehensive planting plan, notes and recommendations for contractors who can quote on installation if necessary. A handover meeting is booked to present the plan and discuss any queries or concerns about sourcing quotes and materials or how to proceed.